Members of staff from Novus Property Solutions have completed work on their own new headquarters, Five Towns House. Home to over 100 Novus employees, Five Towns House was designed by architects Ellis Hillman. Over a three-month period, 15 members of Novus’ team worked in conjunction with the architects to create a pleasant head office space, with a focus on staff wellbeing. The project was co-ordinated by a ‘Move’ team from across the business. The staff were given the opportunity to put their ideas forward in an inclusive consultation exercise. This collaborative approach produced the design for a modern, open -plan office, which comprises different work spaces to support the company’s continuous growth. The main entrance to the building has benefited from a steel framed extension, which features full height glazing on the external elevations. The Novus logo has been embossed on the ceiling and the floors; bespoke reception furniture and fittings ensure that the new entrance creates a lasting impression. The new office also features staff showers and bike stores, in addition to a colourful breakout area. A suite of new meeting rooms have been built around the open-plan space. 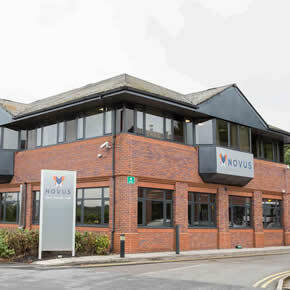 Each facility has been decorated according to the theme of the local area; feature walls are plastered in historic images of Stoke-on-Trent that resonate with Novus’ team. The company has applied its logo throughout the building, using its colours and angular lines to create a cohesive design. A representation of its iconic butterfly logo has been incorporated into the décor in significant areas of the building. For Novus, an important part of the project was ensuring that the building operates as energy efficiently as possible. LED lighting was fitted throughout the new office, and the insulation to the building fabric was improved, to ensure complete climate control. By taking these measures, Novus hopes to significantly reduce its carbon footprint as its staff are moved into the new office space.